Macy's is having an epic holiday hangover. Shares of the department store fell more than 17 percent on Thursday — the stock's worst day on record — after the retailer reported weak holiday sales and cut its profit outlook. Its futures price was down fractionally just before Friday's opening bell. Strategic Wealth Partners' Mark Tepper says this is a Macy's-only problem, and that pockets of retail remain strong. "The consumer is strong. 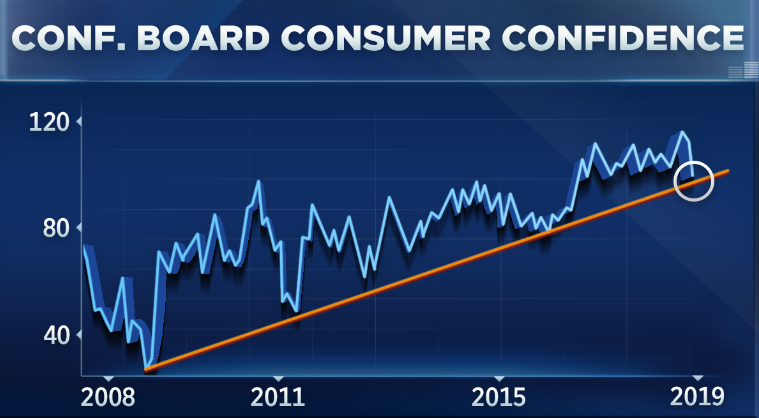 Consumer sentiment is just shy of its March 2018 high, so this is definitely a Macy's-specific problem," he said Thursday on CNBC's "Trading Nation." "It's just not a good company. You know they're a dinosaur. They haven't evolved. They were late to the game in shifting their business towards e-commerce. They have absolutely no pricing power, I mean shoppers walk in expecting a massive discount, which just kills margins." Within the retail space Tepper is looking for companies that focus on customer experience, as well as those that are insulated from e-commerce, at least to a certain degree. "I would be favoring those companies that are evolving while providing a good experience like Nordstrom. Their digital sales are up 20 percent year over year, and the stock would be so much higher if not for their credit card interest error, which to me just represents a buying opportunity," he said. The retailer in November wrote down $72 million in credit card refunds to customers who were incorrectly charged higher interest rates. The stock has plunged around 20 percent since. Tepper also has the consumer in mind in a different way. He believes O'Reilly Automotive is a good opportunity because he doesn't think people are going to buy all of their car parts on Amazon, as some on Wall Street suspect. Like Tepper, Miller Tabak's Matt Maley believes investors can selectively own retail names here. Following Macy's plunge, he said the group of stocks "doesn't look as bad as it might" and that consumer data "still looks pretty good." He's carefully watching two important levels on the chart of the retail ETF XRT. One is a buy signal, while the other is a clear sell sign. 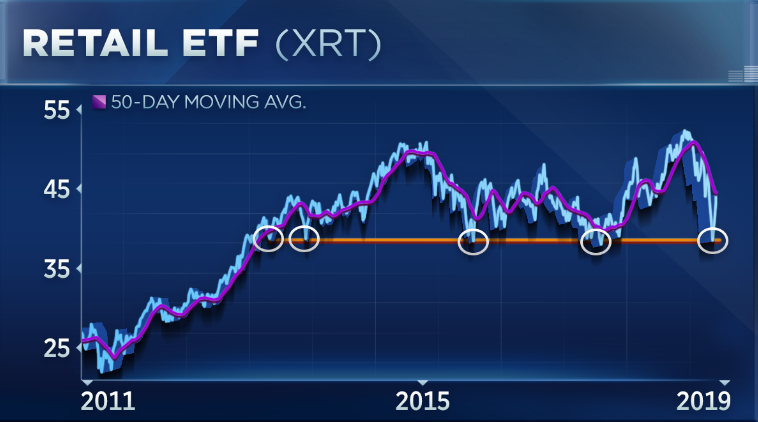 "When I look at the XRT ... on the resistance side we've got a key level at the 50-day moving average. That's stopped the last two rallies in the last quarter or so, so if we can finally break above that, it's going to be positive," he said. "On the negative side, you have a line in the sand at $38.50. That's a level that it has bounced off of five of the last six years, and it did so back in December just a few weeks ago, so that's provided excellent support," he added. The XRT fell Thursday, dragged lower by Macy's, Abercrombie & Fitch, Kohl's, and L Brands, all of which were down more than 4 percent. The XRT is currently hovering around bear market territory. Despite a strong showing in December, it's still down nearly 18 percent from its 52-week intraday high of $52.96, hit on Aug. 22. Disclosure: Mark Tepper owns shares of Nordstrom. — CNBC's Christine Wang contributed reporting.